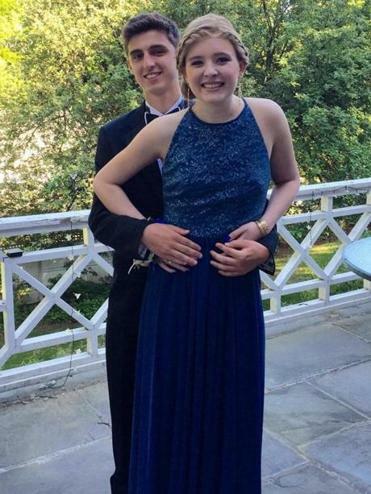 Catherine Malatesta and Peter Clifford on prom night, May 29, 2015. Catherine died weeks later of a rare cancer. Catherine Malatesta played field hockey at Arlington High School, and 18 months ago, as the season was ending, she complained of shoulder pain. She wanted to get it treated before crew season; she also rowed for the school. A couple of months later, in December 2014, the diagnosis came: She had epithelioid sarcoma, an aggressive cancer that strikes 1 in 10 million people. Worse, it had spread to her lungs and spine. She was 16 years old, and hadn’t been sick a day in her life. “She won awards for full school attendance,” says her mother, Jennifer Goodwin. More than that, Catherine was one of those people who brightened a room just by her presence. “She just carried such a positive vibe with her everywhere she went,” says her friend Carly Blau. Catherine was also someone who loved school, loved her teachers, loved learning. During grueling cancer treatments, she studied for her AP exams and passed them all. She loved to debate -- “She could talk a dog off a meat wagon,” says her mom -- and she wanted to be an attorney. Last spring from her bed at Children’s Hospital, Catherine recorded her campaign speech; she was running for student council president. The school played it over the loudspeaker. She won. During one 38-day stretch, she had radiation and chemotherapy simultaneously. There was a clinical trial. Still, for the six months between diagnosis and the end of the school year, she went to class whenever she was able. Catherine’s heart was as tenacious as her brain. She was the kind of kid who cut off her hair for Locks of Love, taught Sunday school, and was captain of a Relay for Life team to fight cancer. But the cancer was oblivious to treatment. Catherine couldn’t go to Italy with her chorus. She couldn’t row crew. She was up for a lead in a school play and couldn’t do it. She couldn’t accept a coveted counselor-in-training position at her beloved Camp Coniston in Grantham, N.H., where she had made close friends over four summers. “She still said every day, ‘How am I going to fight this?’” her mother says. In one hospital emergency room, Catherine told her mother about a prom dress she had seen online. “Let’s buy it,” her mom said. The lovely, smoky blue dress arrived, and it was perfect. They took Catherine’s wig to a hairdresser. Catherine was determined to go to her junior prom on May 29 with childhood friend Peter Clifford. The two weeks before the prom, she was hospitalized with fluid in her lungs. She was discharged at 7 p.m. the night before the prom. She went to the dance and had a great time. But four days later, she was hospitalized, and she remained at Children’s until she died on Aug. 2, 2015. She left behind her mother, father Gregg, two younger brothers, and an army of friends. Goodwin invited Catherine’s best friends to go through her things and take what they wanted. “Her prom dress was still hanging on her closet door, and her friends started trying it on. They said, ‘We should all wear Catherine’s dress,’” Goodwin says. “The Sisterhood of the Traveling Prom Dress” is what Goodwin is calling the effort, in a nod to the best-selling novel, and movie, about 16-year-old girlfriends and some special pants that bonded them. Some of those wearing the dress are camp friends, others are Arlington High friends. The first to wear Catherine’s dress will be Jillian Danton, who is going to the Arlington High junior prom on Friday. Then Emma Schambers will wear it to the East Greenwich High School senior prom in Rhode Island on May 13. Next, Lauren Hourican will wear it to the Arlington High senior prom on May 20. The last one is Carly Blau, who will wear it to the Beverly High School senior prom on June 2. Catherine was 5 foot 7, and wore heels to prom. Not all the girls wearing the dress are built like her, but there is a tailor who is part of the team, who is hemming and un-hemming as needed. Goodwin will tend to the drycleaning and dropoffs.